Talk about a room with a view. Lucky for it, every side is a good side when you have floor-to-ceiling panoramic views that cover nearly every outside wall. 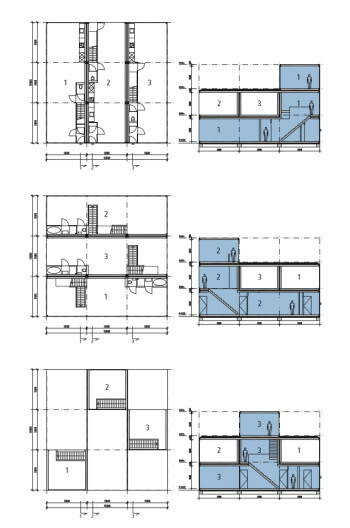 The modules come in three established formats, each with three rectangular “rooms” stacked on top of one another. These three modules can then be pieced together, just like the game, into an interlocking triplex design. Assembled structures can also be personalized to meet the homeowners’ needs. Details like balconies, terraces and shutters can easily be added. The design was originally created by Universe Architecture using AutoCAD, SketchUp and 3ds. According to Ruijssenaars, the designs will most likely be adapted for building information modeling. BIM software offerings like SCIA Engineer have been updating lately to include international building codes. BIM adoption for this project will help ensure that modules created for or in other countries will meet the appropriate requirements. 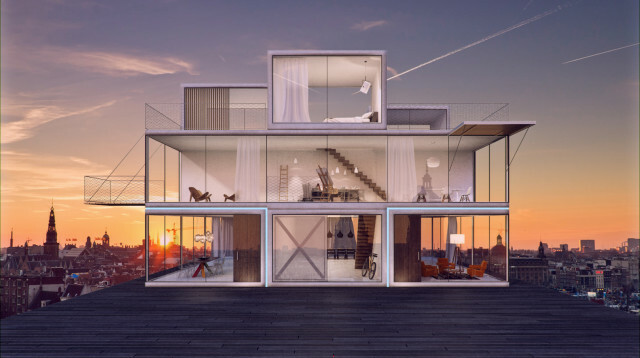 The entire Tetris House structure is constructed of concrete and steel with walls of glass windows. In countries like the United States, these are readily available and affordable materials. This approach could provide a comfortable and convenient housing option for rapidly expanding populations. As a bonus, the concept is just plain fun!